Almost every website I am involved with these days, the #1 item I make sure it has is an embedded analytic tracking code to monitor and record details of visitors. Google Analytics fits this bill, but there is one problem, the data is not exactly real time. Let me introduce you to HiStats.com. HiStats provides unlimited and unrestricted website statistics which are updated in real time and numerous unique counters to choose from. 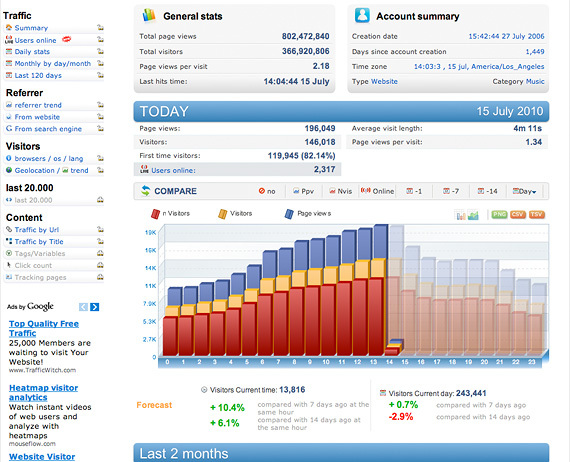 It provides these reports: traffic, visitors, referrer, last 20, special. To get HiStats, you will need to enter your site details and then choose a counter. After 20 seconds you will be given a code which you will need to add to your website.